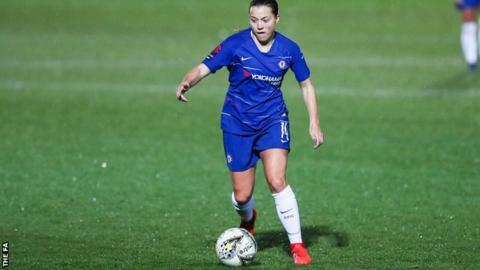 Fran Kirby and Beth England both scored hat-tricks as Chelsea romped to victory over Bristol City to maintain the pressure on Women's Super League leaders Manchester City. Kirby side-footed in her first from Erin Cuthbert's cross and Cuthbert also created England's opener. Kirby then curled a fine third for the Blues before the break. England slid in to convert a fourth and Kirby's penalty and England's header sealed victory. The chances of Chelsea retaining their league title look slim following another win for leaders Manchester City, who beat Everton 3-1 to maintain their six-point advantage over third-placed Chelsea. After England's 15th goal of the season made it 2-0, Kirby added her 12th of the campaign, cutting inside and curling home after Sophie Ingle's ball over the top. And England and Kirby both completed their trebles in the second half against an increasingly dispirited away side. Match ends, Chelsea FC Women 6, Bristol City Women FC 0. Second Half ends, Chelsea FC Women 6, Bristol City Women FC 0. Offside, Chelsea FC Women. Sophie Ingle tries a through ball, but Beth England is caught offside. Goal! Chelsea FC Women 6, Bristol City Women FC 0. Beth England (Chelsea FC Women) header from the centre of the box to the bottom left corner. Assisted by Jessica Carter with a cross. Foul by Erin Cuthbert (Chelsea FC Women). Carla Humphrey (Bristol City Women FC) wins a free kick in the defensive half. Attempt saved. Danique Kerkdijk (Bristol City Women FC) right footed shot from the centre of the box is saved in the centre of the goal. Substitution, Bristol City Women FC. Jessica Woolley replaces Gemma Evans. Foul by Ramona Bachmann (Chelsea FC Women). Poppy Wilson (Bristol City Women FC) wins a free kick in the attacking half. Attempt missed. Francesca Kirby (Chelsea FC Women) right footed shot from the centre of the box is close, but misses to the right. Goal! Chelsea FC Women 5, Bristol City Women FC 0. Francesca Kirby (Chelsea FC Women) converts the penalty with a right footed shot to the bottom left corner. Gemma Evans (Bristol City Women FC) is shown the yellow card for a bad foul. Penalty Chelsea FC Women. Adelina Engman draws a foul in the penalty area. Penalty conceded by Gemma Evans (Bristol City Women FC) after a foul in the penalty area. Substitution, Bristol City Women FC. Poppy Wilson replaces Abigail Harrison. Substitution, Chelsea FC Women. Adelina Engman replaces Ji So-Yun. Substitution, Chelsea FC Women. Jessica Carter replaces Hannah Blundell. Substitution, Chelsea FC Women. Ali Riley replaces Jonna Andersson. Poppy Pattinson (Bristol City Women FC) is shown the yellow card for a bad foul. Erin Cuthbert (Chelsea FC Women) wins a free kick on the right wing. Foul by Poppy Pattinson (Bristol City Women FC). Attempt saved. Magdalena Eriksson (Chelsea FC Women) header from the centre of the box is saved in the bottom left corner. Assisted by Hannah Blundell. Attempt blocked. Francesca Kirby (Chelsea FC Women) right footed shot from the centre of the box is blocked. Assisted by Erin Cuthbert. Corner, Chelsea FC Women. Conceded by Danique Kerkdijk. Offside, Bristol City Women FC. Gemma Evans tries a through ball, but Rosella Ayane is caught offside. Attempt missed. Erin Cuthbert (Chelsea FC Women) right footed shot from outside the box is just a bit too high. Assisted by Ramona Bachmann. Goal! Chelsea FC Women 4, Bristol City Women FC 0. Beth England (Chelsea FC Women) right footed shot from the centre of the box to the bottom left corner. Assisted by Ramona Bachmann with a cross. Attempt blocked. Ramona Bachmann (Chelsea FC Women) right footed shot from outside the box is blocked. Assisted by Ji So-Yun. Attempt saved. Francesca Kirby (Chelsea FC Women) left footed shot from a difficult angle on the left is saved in the bottom left corner. Assisted by Magdalena Eriksson. Substitution, Bristol City Women FC. Rosella Ayane replaces Juliette Kemppi. Foul by Sophie Ingle (Chelsea FC Women). Abigail Harrison (Bristol City Women FC) wins a free kick on the left wing. Corner, Chelsea FC Women. Conceded by Sophie Baggaley. Attempt saved. Beth England (Chelsea FC Women) header from the centre of the box is saved in the bottom left corner. Assisted by Jonna Andersson with a cross. Foul by Francesca Kirby (Chelsea FC Women). Carla Humphrey (Bristol City Women FC) wins a free kick on the right wing.